RedCircle Personalized Weight Management Inc., a subsidiary of American Rejuvenation Centers, offers families in Houston, Texas a chance to give their fathers a gift that will show them how much they are loved and appreciated by choosing a health and wellness program at RedCircle. By reducing the risk of deadly heart attacks and other serious health issues, fathers who’ve been given the gift of wellness have the opportunity to enjoy a long and healthy life. It is estimated that as many as five million families have lost their fathers to heart attacks. As the #1 cause of death among men and the fact that every day over 2,000 American men are struck by a sudden heart attack, choosing the gift of health and wellness this year for Father’s Day through RedCircle’s Weight Loss and Wellness Management Program could make the difference in ensuring your father is around for many more Father’s Days to come. As is often the case, men and their families are sometimes unaware of their risk for heart attack and when it does happen it is often sudden, unexpected and deadly. In an effort to fight against the nation’s number one cause of death for men, RedCircle’s wellness program offers a $100 CardioHealth® test for Father’s Day this year to detect hidden plaques which cause heart attack and stroke. This test, when combined with RedCircle’s other testing that includes cholesterol and triglycerides, determine a person’s overall risk for heart attack and other health issues that might have otherwise gone unnoticed. 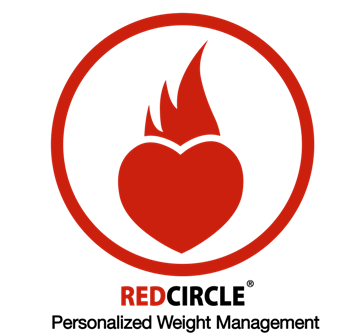 RedCircle also offers two free personal training sessions, in addition to their standard four sessions per month, with a 12-month membership to keep the father in your life healthy and fit. It also offers $149 DNA weight loss testing that will give clients insight into their genetic makeup and determines what will work best in achieving their personal weight loss goals. The individual components that are tailored to each and every client are what sets RedCircle's weight loss and wellness program apart from other "one-size-fits-all" weight loss centers such as Jenny Craig, Quick Weight Loss Centers and many others. At RedCircle, each client’s initial assessment includes advanced body analysis, metabolism measurement, vascular function testing and advanced cholesterol testing among others. This approach, along with supplements, B12 injections, unlimited coaching and accountability for clients, ensures weight loss success and long-term wellness management. RedCircle will also be launching a Teen Weight Loss program in the coming months to incorporate their seven-component system into one designed to address the growing issue of teenage overweight and obesity. As with the core program, the Teen Weight Loss program will remain structured around the scientifically proven components, but with added benefits such as their choice of home exercise equipment of their own. RedCircle Personalized Weight Management Inc. is a subsidiary of American Rejuvenation Centers (Amerejuve) headquartered in Houston, Texas. 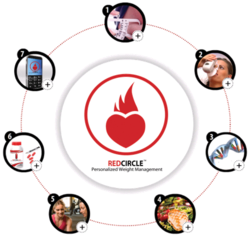 Supported by cutting edge medical technology and distinguished doctors, RedCircle is a Personalized Weight Management Program based on an individual’s resting metabolism, genetic blueprint, cardiometabolic status, fitness, activity and stress levels, and lifestyle. Unlike the “one-size-fits-all” diet programs in the weight loss industry which only focus on dietary intakes, RedCircle is a personalized program and goes beyond dietary interventions. For more information on RedCircle please visit http://www.myredcircle.com or call 713-781-7332.